1-800FASTBED- Latex Mattresses Long Island, New York and Tri State area. Latex mattresses are the Cadillac of all mattresses. All latex and foam mattresses are "no flip" mattresses. The quality of the product is such that it does not require flipping or turning. Perfect for allergy sufferers, Latex Foam will not support bacteria, mold, mildew or fungus and is three times more resistant to dust mites than an ordinary innerspring mattress. Plus, latex is durable and hassle-free. No squeaks or lumps, and it will easily bend to fit in any doorway or up any stairwell. Advanced Comfort Finally, less tossing and turning. Serta’s exclusive Advanced Comfort Quilt is a patented quilt layer designed to deliver superior comfort at the sleep surface while helping to reduce the tossing and turning that can disrupt your sleep. 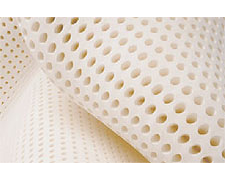 A rich layer of “egg crate” foam is quilted to fluffy fibers, and these work together to cushion every part of the body while helping to improve circulation. This helps to reduce the pressure points that cause tossing and turning so you can get a more comfortable and restful night’s sleep. Kingsdown Latex Foam. Sleep cooler throughout the night. Heat buildup at the sleep surface can make you uncomfortable and disrupt your sleep. Kingsdown Sleep haven is a revolutionary new Latex foam designed to help regulate temperature while you sleep. Only Kingsdown has Cool Nature built into the quilt, closest to the sleep surface, where its benefits are needed most.Sleep cool on latex foam to actually absorb and release heat as needed so your sleep surface is at a comfortable temperature for you throughout the night.